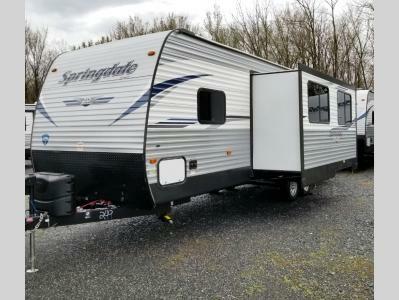 For the larger family, this Springdale 282BH by Keystone is the perfect travel trailer. It features a set of double size bunks, two entry doors, a large slide out, and sleeping for eight people. Step inside using the main entry and see just how spacious the combined kitchen and living area are. 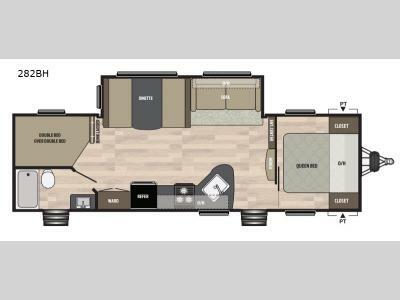 For a quiet retreat, enjoy the front bedroom where you can expect to get a great night's rest.The rear features a set of double bed bunks that the kids will surely love. Or, you can easily take along extra guests. There is a convenient ladder to access the top bunk off the foot of the bed near the slide. You will also enjoy the front pass-through storage compartment for all of your outdoor camping gear.